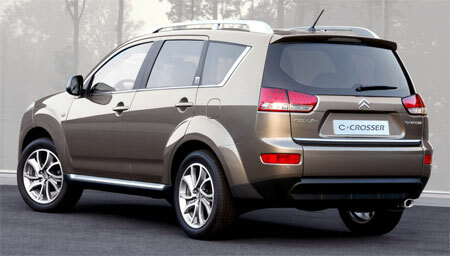 Along side it’s Lion-badged brother the Peugeot 4007, the new Citroen C-Crosser SUV has been announced by Citroen, and is set to go on sale from Summer 2007 onwards, similiar to the 4007’s sales date. 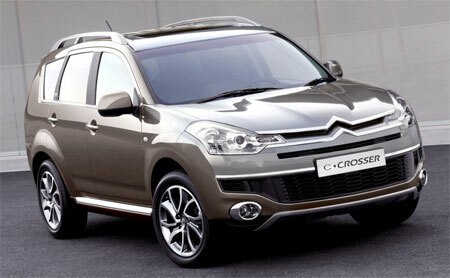 The Citroen C-Crosser adopts the name of Citroen’s C-Crosser Concept 4X4 shown at the 2001 Frankfurt Motor Show. Power is provided by the same 2.2 litre common rail turbodiesel with particulate filters mated to a 6-speed manual gearbox. The 4X4 transmission has the normal three options of 2WD, 4WD and a locked mode for low speed low grip conditions. A feature I didn’t mention in the 4007 post – the tailgate opens in two sections. This makes it easier to load bulky objects into the boot. The lower part is able to support up to 200kg, allowing it to double up as an al fresco seat, perfect for owners with a love of outdoor activities. BTW, have been trying to blog more often, but it’s very hard to post when most posts require photos, this means I have to grab them from the press sources which are huge because they’re also for print media, resize, upload, all of this can be done conveniently with a broadband connection. But what do you know, when the Raya holidays started, Streamyx decided to take a break as well, leaving me with no choice but to use an unlimited GPRS package which is only sufficient for e-mailing and text downloads. Streamyx has been down for 4 days now. Is anyone from TM reading my site?